The most popular Bodybuilding Muscle black baggy workout gym pants you can buy. Relaxed fit, 3-inch waistband with drawcord, two side seam pockets, top quality baggie tapered to the ankle. Great for bodybuilding, yoga, karate, or just for casual wear. Large assortment of colors, fabrics, and sizes. Click on an item to enlarge for better viewing. 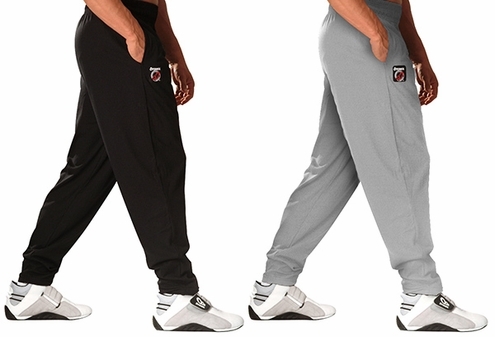 Otomix Style #500 Now your favorite Otomix Bodybuilding black baggy Gym pants come in solids. Solids are made of 100% soft cotton jersey material.